Chakra means wheel or vortex in the ancient Sanskrit language. It's used in energy medicine and energy anatomy to identify spinning vortexes that connect our bodies to the energy of the universe. Each chakra sends out great numbers of energy meridians called nadis, and each has a unique energetic signature and vibration. The most commonly-used chakras in the East are the 7 chakras of the body, as well as the 8th chakra — the energy body or electromagnetic field that surrounds us. Each of the energy centers has corresponding organs, color, element, spiritual theme, gemstones and foods. Although some parallels exist with the 5-element theory, the chakra system takes quite a different approach. 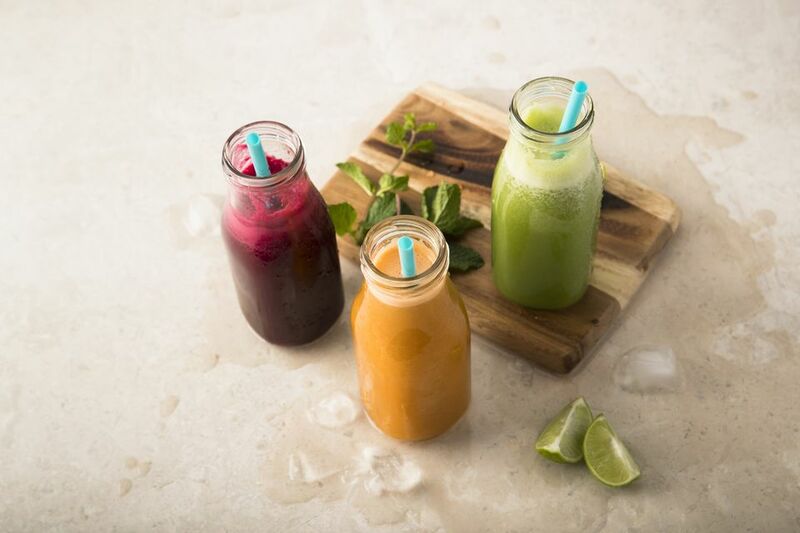 These juices don't contain random gatherings from the plant kingdom — rather, they're ingredients that can harmonize together to create a whole. They offer a rainbow spectrum of phytonutrients. You can make these fruit combinations into smoothies if you own a Vitamix, Blendtec or another high power blender, but otherwise, try juicing. You don’t have to use all the ingredients together. Feel free to experiment with different pairings, amounts and combinations of flavors. We haven’t included specific quantities — that's up to you and your personal taste and preferences. Use black plums, purple carrots, black grapes, blueberries, blackberries or lavender flower. Fruit and ingredient combinations include acai, pear, beet, blackberries, elderberries and eyebright tincture. Try blueberries, blackberries, ginger, lemon, pear or lemongrass. Honeydew melon, anjou pear, cucumber, kale, celery, spinach, parsley, kaffir lime leaf and Hawthorne berry tincture are all appropriate. Use pineapples, mangoes, jicama, golden beets, fennel bulb, ginger, turmeric, coconut water, marshmallow root tincture, dandelion tincture or bee pollen. Try carrots, blood oranges, kumquat, apricot, cinnamon, cayenne, calendula flower tincture or sweet basil. This chakra is separated into vegetable and fruit versions. Use beets, red carrots, tomato, lime, flax seed oil, rosemary or sea salt for the vegetable version. The fruit version can include pomegranate, strawberry, cherries, watermelon, cactus pear, fennel, ginger or lime. Intensely fruity combinations should generally be consumed as smoothies. The amount of naturally-occurring sugar in fruits multiplies exponentially in juice and is not beneficial to the heart.